Meet the new Priest spell from The Boomsday Project! Metabomb is excited to reveal a new card from the upcoming Boomsday Project alongside our sister-site Eurogamer. 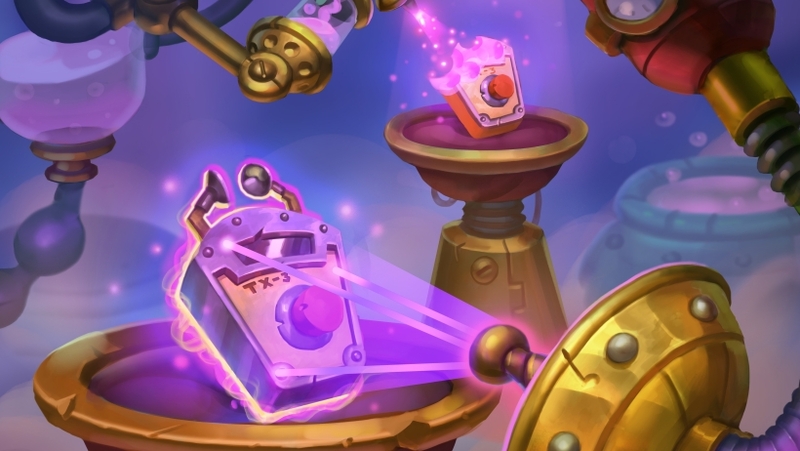 We also had the opportunity to put a few questions to the Hearthstone design team about the creation of Cloning Device. MB: What archetypes do you see Cloning Device empowering and why? I think a lot of people were very excited about the prospect of Chameleos, yet it's seen less play than expected. How - if at all - has that influenced the design of Cloning Device? HS: The 2 best uses for this card are 1. Knowing more about what your opponent is playing and what he hasn't drawn yet. 2. Using their most powerful cards against them! 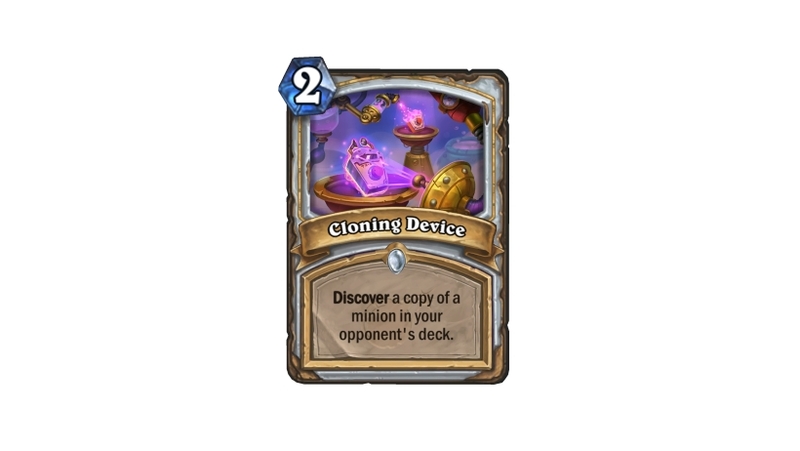 Cloning Device and Chameleos are both cards that support late-game value decks. When decks like Control or Deathrattle Priest become popular, they become interesting options for both the information they give and the potential access to cards unavailable to Priest. In Control vs Control matchups it often comes down to which deck has more late-game threats. Cloning Device can give you another late-game threat while also offering the flexibility of playing something a little earlier if the matchup calls for it. MB: Pre-Boomsday release the Priest has more Discover cards than any other class in Standard. From a design philosophy, what in your opinion makes the mechanic an interesting fit for Priests? HS: One of the coolest things about the Discover keyword is that you get to choose the best option for that particular game. Priests have always been one of the more reactive classes, so a mechanic that plays into that feels appropriate. Part of the identity of Priest is also that they generate cards from their opponent’s deck, so we like to use Discover on cards that generate resources to add a layer of interesting decision-making. MB: Why is now the right time to return to Mechs in Hearthstone, rather than introducing a new or previously under-developed tribe in the game? HS: We felt that with the theme of the set being based around this idea of Science and Dr.Boom’s return, we had to bring back Mechs as well. We think Mechs fit great thematically, but we are doing them differently in this expansion. Mechanically they used to be used in decks where you would play a lot of small mechs, but now the focus is on having versatility and building bigger mechs. The Magnetic keyword was the way we’ve been able to do this. It’s not on all Mech cards, but just enough so that it impacts how players think about Mechs and how to play with them. MB: From the teaser trailer it looks as though the Warrior is getting a Dr. Boom-themed hero transformation card. If that's the case, is this the team's preferred direction for re-prints? Why not just return old favourites to the game as is? HS: Dr. Boom is the Warrior Hero Card! He is an awesome character with a lot of personality, but we didn’t want to just have the same card. We have done something similar in the past with Elise Starseeker, first in League of Explorers and then later in Journey to Un’Goro. We want to continue telling stories about a lot of these characters we have created in Hearthstone, and if we want to bring back familiar faces we want to be able to do it in a way that feels different and exciting. MB: Will Puzzle Lab challenges be static ie present you with the same board state each time, or will the AI be subject to randomised card draw? How many challenges are there in total? HS: Each puzzle presents you the same challenge each time. There are over 120 challenges.